EM500 hides behind a standard RJ45 jack and occupies only 18.5x6.5mm (0.63x0.26") of board space. The EM500 is an ultra compact Tibbo BASIC/C-programmable IoT Module with Ethernet and optional Wi-Fi* connectivity. The EM500 has one UART. The first member of our MiniMo family, the EM500 is designed to be used in tandem with a standard RJ45 magnetics jack. The combined footprint of the EM500 and a typical jack is only 28.5x18.5mm (1.12x0.63"). 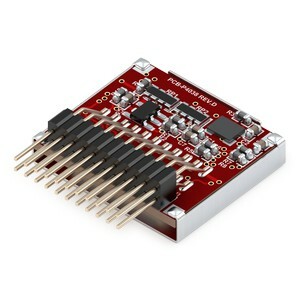 Compact dimensions, space-saving "vertical slice" form factor, low power consumption, and economical pricing make the module an excellent fit for miniature, cost-sensitive "connected" devices. Module testing and evaluation can be performed with our EM500EV development system. The EM500 may be uploaded with a fully functional serial-over-IP (SoI) application that turns the EM500 into a powerful serial over IP (SoI) device, a.k.a. the Ethernet converter. * Requires the GA1000 Wi-Fi add-on to be connected externally.